In the future you can be one hundred years ago and yet look barely fifty. It’s all thanks to innovations like Smart Blood and Diamond Skin. Alcohol is restricted, coffee is banned and meals consist of nutripacks or perhaps a “trad food” like a salad. The most popular mode of transport is walking. You might even live forever under the Third Wave of Maintenance but in a world where arts and music are forbidden, will you want to? When Lea is accidentally hit by a car she finds that her life is suddenly under observation by the Ministry. She manages to infiltrate the Suicide Club, a group of people who have had enough of this endless life with little pleasure who revel in pleasures like eating meat and listening to jazz. Some ultimately choosing to end their life. Suicide Club is a very dark novel but I was fascinated with the world Heng has conjured. It’s like a nightmare stereotype of LA, people who all look a little similar, have perfect skin and hair, drink green healthy drinks and exercise all the time – because they’re not really allowed to do much else. None of the characters are desperately likeable but that doesn’t matter because the story really pulls you in and holds you there. Disturbing and compelling. Another one of those books that I’ll be thinking about for years. Suicide Club by Rachel Heng is out now. 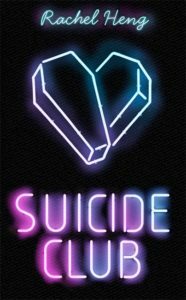 Disclaimer – I received a digital galley of Suicide Club by Rachel Heng in return for an honest review.